Ste Catherine and Ave de Lorimier. Every year in the summer, Montreal has the International Fireworks Competition on the river. Saturdays at 10PM, and some Wednesdays. It seems like the whole of Montreal descends to Metro Papineau, with friends and family, to watch the fireworks. It is a long walk, from 20 to 40 minutes, to the areas under the Jacques Cartier Bridge on the Montréal side of the St. Laurent river. Walk to the junction of Rue Notre-Dame and Ave de Lorimier, and other areas around here – all this is easy to find – just follow the crowds heading in that direction on firework evenings! People stake out spots early. Families bring chairs, blankets, and lay them on grassy areas or even on the street itself. The whole viewing area is huge, so even with so many people, there is never any crowding on the streets. The new Village au Pied-du-Courant beach area does get full, so if you want to get in there, may need to get 1-2 hours earlier. Getting on the bridge itself requires even more walking – since the entrance is around Ave Papineau and Rue la Fontaine junction, so you have walk up northwards from Metro Papineau, and then walk back southwards up the bridge ramp to get on the bridge for a good view. Again, people come here early starting around 8:30PM! And all the good spots will be taken by 9:30PM or so – people will be lined up all along the edge of the bridge. But if you are OK with all the walking, it is fun to sit in the middle of the bridge roadway. The view here is different, in some ways better, but in other ways not, as compared to the Rue Notre-Dame or nearby streets. There are around 8 nights over the summer when they have the fireworks show. 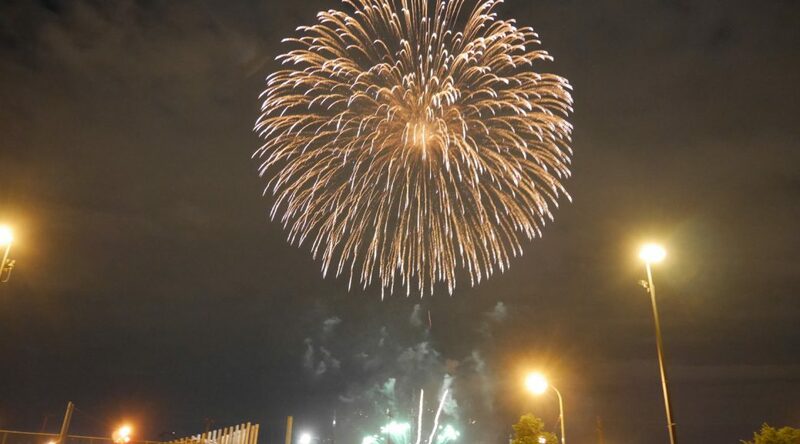 A great place to watch the fireworks is actually right next to Metro Papipeau. A 2 minute walk will bring you to corner of Ste Catherine and Ave de Lorimier. It is fantastic! Easy-in, Easy-out location. If you have only 30 minutes, then that is the best choice. If you have around 60-90 minutes, then follow the crowds from Metro Papineau, walking towards Ave de Lorimier, and then towards Rue Notre Dame. Find a place to sit, and have a picnic! There are no restrooms or restaurants in the area. But now that the Village Pied-du-Courant is open (until midnight on fireworks nights, check their website), if you have 90+ minutes, then after 10:30PM, wait until the Village empties out when most of the fireworks watchers leave, allowing for more people to enter. There you can find food trucks and bars selling alcohol, a DJ playing music, and restrooms too. And a great view of the river and the Jacques-Cartier bridge. The Village entrances are at end of Ave De Lorimier, or Rue Fullum, on Rue Notre-Dame. Avoid bringing a car. All of the streets in that area will be closed, and there is no easy public parking in the area. If you have 3 hours and are adventurous, try the Kayak tour and watch the fireworks from the northern tip of the Île-des-Soeurs (Nun’s Island)! Book at the Navi site. This specific group is quite popular, so tour may sell out in advance. Here’s a Montreal Fireworks Fan site.